Cook in bulk to save time, sanity. Those of you who read my resolutions for this year already know that I'm trying to do much more bulk cooking. For anyone with even rudimentary cooking skills (if you can chop, stir, and not get distracted while everything is burning) and a few free hours, bulk cooking is the way to go. You can make a double or even triple batch of your favourite recipe without doubling the time, and with the help of extra time-savers like a food processor (to slice, grate, chop, or puree) and an immersion blender (no need to lug out the hard-to-clean full-size blender) you'll have dinner on the table, plus up to a week's worth of future meals to freeze. Here are my tested, go-to recipes, from my own trial-and-error cooking or from trusted websites, to fill your tummies and freezers. *For all recipes below, when reheating leftovers you can save time by defrosting the serving in the fridge for a day. Reheating from frozen works too, but it will take longer. 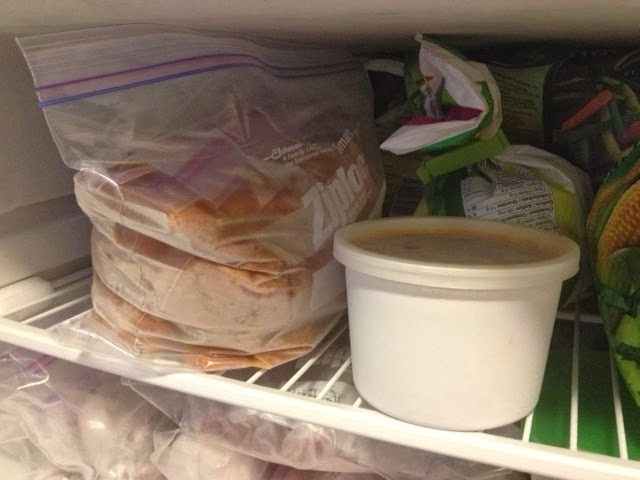 Make sure leftovers are heated through, and avoid heating and freezing the same portion repeatedly. This is an easy macaroni and cheese because it doesn't require a cheese sauce (which often scalds in the pot). You can make it in multiple small dishes or a giant roasting pan, like we did in the photo. Preheat oven to 350F. Grease a large casserole dish with butter. Shred at least 4 cups total of your 3 of your favourite cheeses (cheddar, mozzarella, and emmental are a good mix. Avoid using only strong, stinky cheeses like blue cheese) as well as parmesan cheese. In a large pot, boil lots of water with a big pour of salt from the salt box. When the water is boiling, add a large (or two, if making a mega batch) bag of macaroni noodles and cook according to directions on the bag. While noodles are cooking, arrange the following ingredients around the casserole dish to make an assembly line: bowls of Italian breadcrumbs, flour, 3-cheese mix, parmesan cheese, and your salt and pepper shakers. 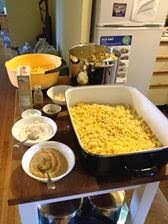 Drain; add noodles back into the pot and mix in a big slice of butter so that it melts over the noodles. To assemble, place a shallow layer of noodles in the dish. Sprinkle with cheese blend, parmesan, flour, breadcrumbs, and salt & pepper. Then repeat layers until noodles and cheese are done. Add extra breadcrumbs and parmesan to the top layer. Cook covered for 40 minutes; it's ready when cheese is melting and you can see bubbling liquid throughout. Once the leftovers have cooled, you can slice off individual servings, wrap tightly in tinfoil, and freeze. To reheat, unwrap slice and cook at 350 in a glass dish until heated through. -Be extra-generous with the Cajun spice mix. I usually use 2 tbps. -The recipe doesn't call for any veggies but tomato, but I always add a big bowl of carrots, celery, yellow peppers, and zucchini. Use whatever veggies you like, but mushrooms don't hold up well. You can also add chopped up tomatoes instead of canned tomatoes. -Use mixed beans instead of red beans. I use 2 big cans' worth. -A can of condensed tomato soup is better than tomato paste and sugar (sometimes I still add sugar if the chili tastes too acidic). -Simmer for a few hours to really get the flavours mixing and the veggies cooked through. -If serving to spice-friendly people I add a little sriracha. -You can easily make meatless chili; just use 1.5 cups of TVP hydrated in hot veggie stock instead of sausage. Making this in bulk is much better than preparing a sauce every time you want to have spaghetti. Prepare the following chopped ingredients: onion (1) and garlic (3-4 cloves) in one bowl, veggies (carrots (2), celery (3 stalks), mushrooms (1 box), yellow and orange peppers (1 each) in a large bowl, and 4 chopped tomatoes in another bowl. In a large deep pot, heat a few glugs of olive oil on medium. Add onions and garlic and cook, stirring, until almost translucent. Add 2.5 lbs of lean or medium ground pork and stir until broken up. Once meat is cooked, add big bowl of veggies and stir until the meat is mixed well. Add some generous dashes of dried herbs (oregano, thyme, marjoram, lots of basil). Add the chopped tomatoes and 2 large jars/cans of tomato puree; stir. Add a teaspoon of salt (more if the sauce tastes bland) and a tablespoon of sugar (more if it tastes too acidic). Turn heat down to low, cover and simmer for an hour. Serve over your choice of noodles. Makes 7 2-person servings. This is a thick, easy, and tasty soup from the Clean Eating Chelsey blog. Feel free to substitute the veggie stock with chicken stock if you are feeding omnivores. 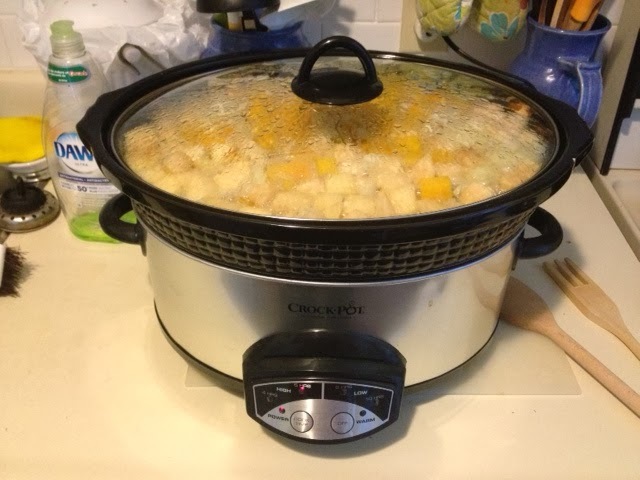 If you have an immersion blender, you can blend the soup right in the slow cooker instead of transferring everything to a blender (which is messy and requires more cleanup). Serve with a dollop of sour cream and some crusty bread, like the New York Times' famous no-knead bread. Enjoy your hearty meals, full freezer, and extra time!